Not that mindful, but I love these swimming costumes designed by Swimming Star Esther Williams (The Million Dollar Mermaid). Born in USA in 1921, Williams was a competetive swimmer but was unable to compete in the Olympics because of the outbreak of the second world war. 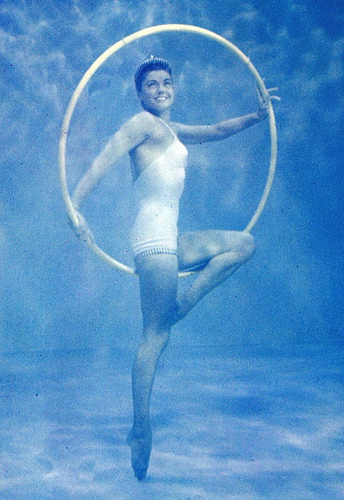 Instead she starred in Billy Rose’s Aquacade a music dance and swimming show. The show was spotted by MGM and gave rise to a series of Aquamusicals featuring synchronised swimming and diving. Williams went on to become one of MGM’s top female box office stars ever. She retired from films in the early sixities and amongst other activities she now designs beautiful, retro swimsuits. I definitely want one (at least). This entry was posted in swimming equipment. Bookmark the permalink.